This very stylish 430-square-foot apartment a few minutes walk from Piazza del Campo. You will not need anymore to walk up 66 steps to access this apartment,because now there is a new elevator to lift you on two amazing terraces and their spectacular views. The main living space here is a large, sunny living room with sofa, dining table and kitchenette featuring a full fridge,dishwasher, cook top,satellite TV, DVD and stereo system. Off this room is the double bedroom, which has a queen bed, and off that room is the modern bathroom with stall shower.Now for the fun part! A French door from the living room leads to a charming covered terrace with unforgettable views of the city. Back in the living room, a flight of stairs leads up to the second terrace, on the roof, furnished with deck chairs and sun umbrella.This was a wonderful place for a glass of wine or sunbathing. The views from here are even more breathtaking, including the Duomo and the famous Torre del Mangia seeming close enough to reach out and touch. The House/Apartment: The building appeared to be quite ancient, but was in lovely condition. There was a marble staircase leading to the apartments. The lower apartments housed businesses which were only open during the week. The other floors had three or four apartments each, but we hardly ever saw the other tenants. The apartment building had no elevator and it was a hike up to the fourth floor. Once there, Siena Vistas was another flight up through a private door. We definitely got our exercise, but it was worth it. The porch area of the apartment was very quiet and relaxing and it was there that we spent most of our time looking out over the town, watching the kite birds soaring overhead as the sunset every night. Delightful! Terraces: The interior of the apartment was quite small, but the outside, covered porch area made up for it. There was a nice sitting area with two comfortable chairs, a sofa and a coffee table. There was also an eating table with six chairs. The porch had a roof and a shade to block the hot sun. We ate breakfast and dinner out there every day. There were no bugs and the window boxes of blossoming geraniums were gorgeous. Stairs led from the apartment to the roof deck which had a panoramic view of the town. It had two lounge chairs, a sun umbrella and an eating table with four chairs. This was a wonderful place for a glass of wine or sunbathing, if only we had had time. Location: Siena Vistas was located right in the centre of Siena, just a 10 minute walk from Il Campo where the Palio is held. The apartment was on the fifth floor of a lovely, old building and had a very quiet spot in the rear overlooking the town and the surrounding hills. It was beautiful!The apartment was located on the main shopping street of Siena. There was a modern grocery store right around the corner that was open seven days a week until 8:15pm (7pm on Sundays). Just next door to the apartment was a grocery with more specialized items and more limited hours, but still a great place to shop. There were also many nearby restaurants and little shops. There was an internet point close by and the post office was across the street. When we first arrived we thought that is was just musty from not being used and would air out if we opened the windows. Unfortunately each day it got worse and when my wife did laundry on our third day she noticed that the source of the smell was mold growing in the small room where the washer was located. By the time we left we noticed the mold growing on the floor of the bathroom as well. By day 4 both of us noticed that within minutes of being in the flat we started getting headaches and sore throats which disappeared within an hour of leaving the flat. I am sure the mold is in the air and is extremely unhealthy. Like Elpeth we found the unit needed a thorough deep cleaning and the oven she mentioned in her review had still not been cleaned. We put up with this for 4 days and emailed the owner that we were going to leave and I am writing this review on what should have been our 6th night in the flat. Instead we booked a hotel at additional cost for our last two nights in Siena. I am upset that we are paying twice for two nights of lodging but I am more angry about the time the owner of the unit has stolen from our once in a lifetime vacation in Italy that we planned for over a year. At this time of year it took several hours to find and move to a new accommodation. As of this writing we still have not heard back from the owner and he didn’t even bother to acknowledge the issues or give us instructions as to where to leave the keys. Something we would have needed on our normal check out day in any case! What is so terrible about the owners’ apathy is that the flat is very well done with probably the best views in Siena from the roof top deck. The unit has several televisions, Wi-Fi, espresso machine, nice dishes and modern construction. It is also in a great location and easy to reach from the bus station. Within minutes you can be in the main plaza and the main street of the old town runs into the square the apartment is located. We planned to spend the first few days in Siena exploring and then the last few days relaxing on the patio and being lazy. The flat is perfect for that except the umbrella for shade is broken and the flowers shown in the picture are long dead. It appears nothing has been done with the flat since the pictures were taken several years ago. In case the above seems sugar coated let me be plain spoken and say…DO NOT STAY AT THIS FLAT UNTIL THE OWNER THOROUGHLY CLEANS AND SANITIZES THE FLAT! Good location at the north end of historic Siena; great roof top terrace with 360 degree views, food market and specialty stores near by, free parking a short walk away but no need for a car except for excursions. This is not a "rental" unit but is occupied by the owner when not rented. The oven was filthy and the fridge had 1/2 eaten food and open drinks in it. We were given no instructions as to how anything worked, no contact for an emergency. We blew a fuse which meant no electricity and no water for the entire unit. No telephone, contrary to the website. Luckily. Some students who lived in another rental apartment could contact the owner and found the fuse box hidden behind a wall. The lower terrace is in fact an enclosed living room with the owners office and professional books. about this as he lied about the condition of the apartment. I stayed at this property for 10 days in Sept. and enjoyed every single minute of it and the enchanting city of Siena. I didn't want to leave but I know I will rent this flat again. The photos are very accurate but the view from the terrace must be seen in person to be truly appreciated. To see the city change with the time of day and the different weather patterns was magical. I couldn't get enough and spent most of my time on the terrace when I wasn't out walking the city. If I can just drag myself away from the view for a moment I will say that the flat was very comfortable and well equipped. Ideal for 1-2 people although I think the couch is a bed. The bed is very comfortable. The bathroom is new and modern with fantastic water pressure. There is a washing machine too which is a must especially when traveling for long periods. Also there are many guide books and maps which was a huge help. As others have stated there are a lot of steps leading up to the flat but unless you have physical restrictions it is totally worth the walk. I found that after walking Siena day after day the climb got easier. On the practical side I took the bus in from Pisa and I was happy to discover that it is in easy walking distance from the bus stop. I loved the location. The owner and his father were very helpful and easy to communicate with. This is a wonderful place to stay in Siena if you are there for five days or more (and it is certainly a city worth spending time in). It is not for those with mobility issues because there are a lot of steps up to the flat and then internal stairs as well. But for those of ordinary or better fitness, the fabulous 360 degree views from the rooftop over Siena and the Tuscan countryside more than compensate. And the steps are not as daunting as the numbers sound - they are wide and shallow and there are several landings. The flat itself has everything you could want - a fully equipped kitchen including all the basic provisions to make a meal, for example olive oils and balsamic vinegar. The bathroom has a good shower and is well lit. It also has a washing machine. The enclosed terrace or sitting room is very comfortable, with quality couches, and those amazing views. There is useful reading material in English about Siena. And importantly, the bed, in a separate bedroom with good cupboard space is also very comfortable. The highlight for us was the roof terrace - relaxing on the sun lounges, or having lunch or a glass of wine at the table, and being able to gaze around at Siena's architectural wonders. There is a high quality grocery/delicatessen/wine shop practically next door (to the right from the front door) selling the best of Tuscan produce, and a very large supermarket tucked away downstairs in an arcade to the left just a minute's walk away. We tried a variety of local restaurants. We didn't have any outstanding culinary experiences, and preferred the unpretentious osteria which offer limited menus of good home style Tuscan cooking and decent house wine for very reasonable prices. Siena is a small city, and all its major attractions are within an easy stroll of the apartment. It also makes a good base to explore the Tuscan countryside or for a day trip to Florence. Not having a car we booked a day trip with local guide, Donatella, to visit some wineries to try the famous Brunello di Montalcino. This was a great day out with a very engaging and knowledgeable guide. Overall, we highly recommend a stay in this Tuscan flat. 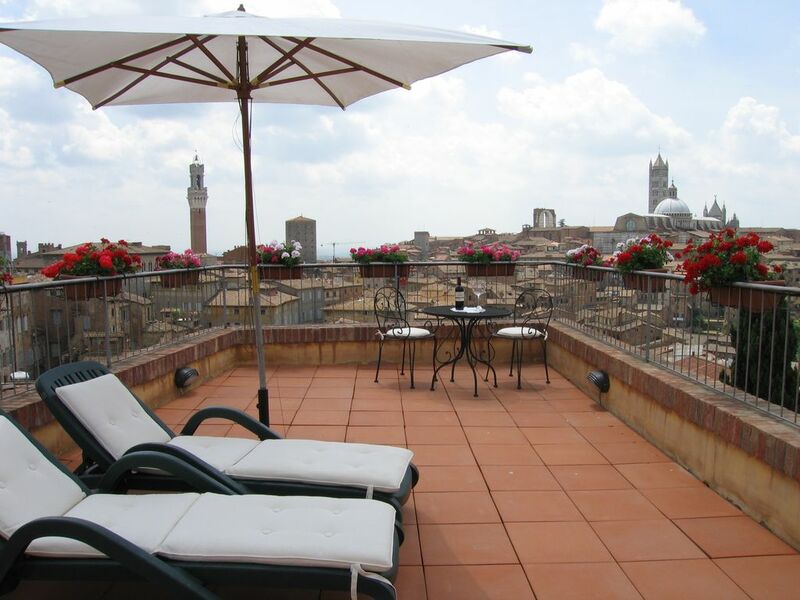 This apartment was extremely well located in the heart of the historic center of Siena. It was easy to walk to restaurants and sights and one of the main bus centers was only about a block away, for excursions to other towns. Also, there are two grocery stores on the same block, a large one and a smaller, more gourmet one. The views from the outside terrace and the inside living area were fabulous. You couldn't have asked for better views! We were also surprised at how quiet the apartment was. We heard no street noise, only the church bells and some noise from the other apartments. The apartment was very well outfitted in terms of kitchen supplies and technology. The wi-fi and flat screen TVs were great for keeping us in touch with home and the world. The shower was the best we had in 4 weeks in Italy. The downside of the apartment is that it was very small. In addition, while it was "picked up", it was not the cleanest apartment that we had stayed in. Not bad, but certainly not pristine. Also, we didn't know until we arrived there that this is not just a rental unit. It is the owner's apartment and while this meant it was very well supplied and had beautiful artwork, it also meant you are living with the possessions of someone whom you don't know. I don't know if everyone is comfortable with that. The owner was prompt in responding to emails although I had to initiate them to ask about apartment location, payment, etc. There are two girls who live in the apartment downstairs who let us in and answered questions for us and they were very sweet. The stairs would be an issue for someone with mobility problems but they were not a problem for us. Going up all of those stairs is the reason that you have such fabulous views! I would definitely recommend this apartment for someone visiting Siena.